Accompanied by a discordant soundtrack, the opening credit sequence rolls over images of primitive cave drawings and strange limestone formations. Thus the tone is immediately set for this masterful thriller, which explores the darkest depths of the human psyche, and the atavistic impulses still at work below the surface of modern man. The strange cave imagery gives way to tranquil scenes of the countryside surrounding the Perigord village of Le Tremolat, and to the people of the town as they come together to celebrate the wedding. The community and setting are captured here, and throughout, with such unassuming realism, that you feel you could almost be watching a documentary about life in a small provincial French town. On to this stage step Miss Helene and Popaul, whose budding friendship triggers the brutal violence visited on the previously peaceful community. At first it seems an unlikely match; the independent, yoga-practising schoolmistress and the earthy, ex-army butcher. But both have in common an emotionally scarred background: Helene by a relationship that went wrong ten years before, and Popaul by an abusive father and ten years service in the war zones of Indochina and Algeria. The difference is Helene has no desire for emotional entanglement, while Popaul longs for it. His desperate need and her inaccessibility is reflected in one scene when he sits beside Helene on a child’s chair and looks shyly up at her face, trying to find some sort of connection beneath her polite expression. It’s a testament to the wonderfully nuanced performances of Stephane Audran and Jean Yanne that we come to care for their characters as much as we do. Even when the killer shows his hand, we feel pity as much as revulsion. 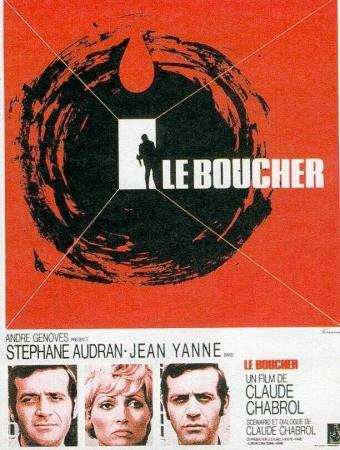 Le Boucher is one of Claude Chabrol’s greatest films and his most overtly Hitchcockian. The small town location, the nerve-jangling suspense, the theme of exchanged guilt are all reminiscent of Hitchcock’s films of course, but Chabrol here brings his own unique perspective to the story. The abrupt shift in mood from the pleasant normality of life in the provincial village to the horror of the killings is unsettling in the extreme, and the harrowing events of the final act make this one of the most perceptive examinations of the darkness of human nature ever put on screen.